Have you ever played a board game such as Scrabble and thought this game is going to last forever, Or do you get when is it my turn? when playing slow paced games? Well we have the solution with the fast paced banana grams strategy game with easy rules. You are spelling, creating words from letter tiles, using your own vocabulary and building upon it in a crossword type style. Bananagrams is a fast and fun word game that requires no pencil, paper or board. All you need is a table. One hand can be played in as little as five minutes. It is a great for family fun as well as being educational. 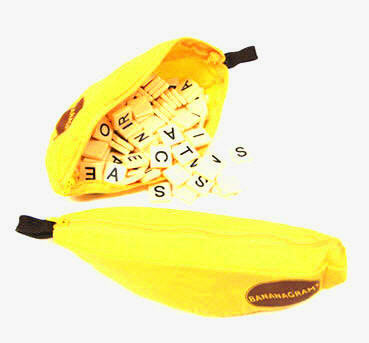 Bananagrams portability makes it perfect for travel. Just grab the pouch and go. 1. Place all 144 tiles face down on center of table. These tiles are referred to as the "BUNCH". For games of 2-4 people, each player takes 21 letters from the bunch, keeping them face down. For 5-6 players, 15 letters are taken. For 7-8 (or more) players, 11 letters are taken. NOW THE GAME BEGINS!!! 2. Any one player says "SPLIT" whereupon all players turn their own tiles face up and proceed to form their OWN collection of connecting and intersecting words. The words may be horizontal or vertical, reading left to right or top to bottom. Each player may rearrange hiShipping and Handelinger own words as often as desired. Players DO NOT take turns, but play independently of each other and at the same time. 3. When a player has none of his or her original letters left, that player says "PEEL" and takes a tile from the bunch. At this point ALL OF THE OTHER PLAYERS MUST ALSO TAKE A TILE FROM THE BUNCH and add it to their collection of letters. 4. At any time, and as often as desired during play, any player may return a difficult-to-use letter back to the center of the BUNCH, face down, but MUST TAKE THREE LETTERS IN RETURN . The player must declare this action to the other players by saying "DUMP". This exchange does not affect the other players. 5. Play continues until there are fewer tiles in the BUNCH than there are players. The first player with no remaining letters shouts "BANANAS" and is the winner of that hand. The other players may now inspect the winning hand for misspelled or incorrect words. Proper nouns are not acceptable. Any available dictionary may be used. If all words are acceptable, that player is the WINNER OF THAT HAND. If any word in the "winning" hand is found to be unacceptable, that player becomes the "Rotten Banana" and is OUT OF THAT HAND, and must return letters, face down to the center bunch and the game now resumes for the remaining players. Carrying pouch that is pretty groovy.